I consider my style to be more feminine than girly. I enjoy collecting jewellery, wearing dresses and painting my nails, however I’m adverse to anything cutesy and the colour I’m probably least drawn to is pink. French Kiss and Eau de Lingerie both seem to be quite far along the pink and girly end of the perfume spectrum. 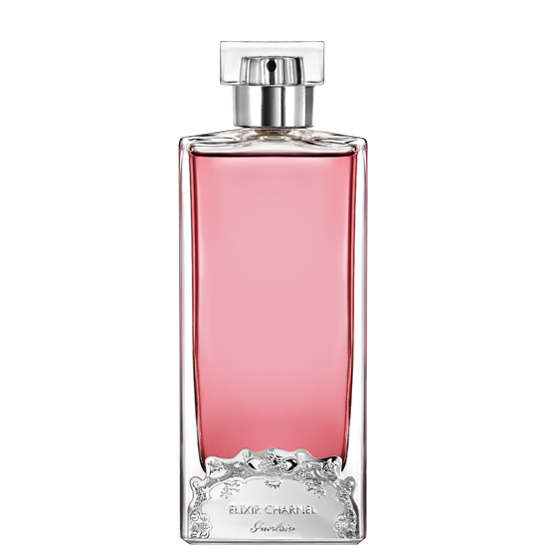 They come under the auspices of Guerlain’s Les Elixirs Charnels (Carnal Elixirs), the luxury line which also contains Gourmand Coquin and Oriental Brulant. French Kiss was released in 2014 and contains notes of litchi, raspberry, violet, rose, white musk, vanilla, iris and heliotrope. The combination of litchi and raspberry results in a cherry-like aroma that is closer to scented lip balm than lipstick. It’s sticky and syrupy but a healthy dusting of powder and its cloud-like feel manage to keep French Kiss from being suffocating. It settles into a fruity cosmetic scent with a handful of sugared almonds thrown in. It’s an unchallenging confection with a light-headed, fluffy personality. There’s certainly a big market for this kind of gourmand-lite, flirty fragrance but I can’t help expecting more from a fragrance that is part of an exclusive Guerlain collection. At this price-point you could go for Misia, Chanel’s more grown-up take on a cosmetic scent or Frederic Malle’s Lipstick Rose which possesses both sophistication and wit. Then, for a lot less money, there’s the raspberry inflected boudoir scent of Tart’s Knicker Drawer by 4160 Tuesdays. Eau de Lingerie was released in 2013 and contains notes of iris, rose, vanilla, sandalwood, white musk and ambrette. As the name suggests, Eau de Lingerie is actually a fabric spray to be misted onto your finest under-things. I can’t quite make up my mind whether this is a cunning marketing ploy or a harmless frippery. My natural instinct was to apply it to skin but as it’s not the intended use I put some on chiffon instead. However, I struggled to pick up any nuances from the material so ended up dabbing it on my wrist anyway. After a hairspray start, it settled down to a powdery, mildly floral, innocent white musk with a smidge of vanilla. Laundry fresh, skin soft and feather light, Eau de Lingerie is a barely there wisp of silk. I understand it’s been designed not to clash with your personal fragrance so I can see why they’ve made it so diaphanous. It’s perfectly pretty and could be a good gift for the woman who has everything. However, it’s not alluring enough to tempt me into taking up this “new beauty step”. Do you like any girly perfumes? What do you think about the concept of a fragrance solely for lingerie? This entry was posted in By Tara, Fragrance Reviews, Gourmand, Guerlain and tagged Fragrance, Gourmand, Guerlain, Perfume, Review. Bookmark the permalink. A pink-coloured fragrance or bottle,to me, is a warning sign …. That, chances are, this isn’t going to go well…. There are exceptions, I was given a bottle of DKNY Fresh Blossom Eau So Intense that was actually quite nice & wearable, but still not quite my thing and I regifted it. I’m trying to think of other girly fragrances in my cupboard…. And am pretty sure there are none. I’m more like you, Tara – feminine is the go. Ha! A pink hued perfume is often a warning sign, Tina. It’s true. Shalimar Parfum Initial had pink juice and wasn’t for me. I really like grown-up feminine perfumes and that’s why Burlesque attracted me when I read about it. French Kiss is inoffensive but just not sophisticated enough. I thought French Kiss was a bit of fun but nothing I’d buy, and I wouldn’t consider the Eau de lingerie I must say. So I suppose I’m with you when it comes to feminine yes, but girly no! However I do enjoy a deep pink colour, (not the pastel rose pink) but that’s because I like most powerful colours. I enjoyed you review and especially that clever divide between girly and feminine. Whereas I hardly ever wear nail varnish, don’t do that much jewellery even if I love looking at it, if I’m honest I probably do have a very micro cutesy side, but that doesn’t extend into perfumery. It is a fun and flirty cosmetic scent but it’s pricey for what it is. I agree about deep pink – I’m not adverse to that. I like dresses that are magenta/deep pink. It does 🙂 anything aww! probably, and yes Magenta was the colour I was looking for fuchsia is what we call it, but that doesn’t exist in English, does it? We have fuschia! Very popular in my 80s youth. I had a fuschia belted shirt dress and matching fuschia plastic earrings. I find the name ‘Eau de Lingerie’ funny for some reason, it just sounds sort of Oh lala, like a comedy take on French. The last thing I’d wear is pink frilly clothes or perfumes with a similar style, but anyway, of these girly perfumes the only one I can wear is Drole de Rose and that only when I’m in a very gentle mood or want to feel soothed. I tried Lipstick Rose in sample, and it was very pretty but too confectionary for me, I wanted it to smell more waxy, less sweet, like real lipstick. It is a pretty funny name. Drole de Rose is girly and pretty without feeling infantile. Good call. I got strawberries from Lipstick Rose the last time I tried it but need to test again. Traversée du Bosphore is fab. I doubt as many people would want to wear it if it actually smelt like the Bosphorous. I am afraid that along with scented drawer liners and ironing water, I consider a scent for your underwear to be a ‘pointless frippery’, which reminds me that as a child when my father doled out my pocket money he always cautioned me not to spend it in ‘foolish fripperies’. It was hard to spent it on more than a few penny sweets in fact, as I only got one old penny for every year of my age. So at age 10, this was less than 5p in new money, haha. But I digress. Am definitely not one for pink scents as a rule, though I am partial to Shalimar Le Parfum Initial, which has a striking combination of pink juice and blue tassle. And I agree that French Kiss is a bit of a lightweight stablemate for those other Elixirs Charnels. And by the sound of it not even very charnel! Oh, I just saw that you don’t get on with Le Parfum Initial – but the colour scheme is easy to like, wouldn’t you say? Yes, the contrasting colour combination is very pleasing. V, I guess it’s nice if you can afford to expend the time, effort and money but there are many higher priorites than this kind of thing for most of us. You really didn’t have much opportunity to spend your pocket money on foolish fripperies at that rate! French Kiss isn’t in the least bit charnel, sadly. As for girly, I really enjoyed YSL’s Parissiene – it was so pretty! I do like dusty pinks nowadays (like Asali – no pastels) and recently have started enjoying deep pinks in textiles (sarees) when combined with other colors (like yellow and cream). Ok – that doesn’t sound so nice when I describe it..lol. Oh Lavanya, I just love your ballet shoes story. It shows how good it can feel to step out of our comfort zone sometimes. Deep pink sarees are gorgeous and I bet your colour pairings work really well. Post some pics! I think it’s fair to say that most pink fragrances are indeed sweet and sugary. I bet your dining room looks fab! It fascinates me that my niece is such a girly girl because my sister and I never were. Pink is a flattering color on most – the undertones are important, though. Pink tourmaline is a beautiful stone. I like pink. However, I don’t like sweet stuff from Guerlain, no matter what color they use. I’m waiting patiently for that marshmallow accord to wear itself out – or become IFRA non- compliant! I want to see a pic of the pink mohawk! I bet you looked amazing. Eau de Lingerie is too light to interfere with anyone’s perfume but good point; it could well be overwhelmed by scented fabric softner. So I’ve spent some time thinking about my answer since than Tara. I have soaps in my undie and sock drawers so I suppose I already scent my underwear. Maybe it’s not as freaky as I thought, or maybe my freak monitor is usually set to high and there was a glitch? I do not believe many of us need a fragrance for our clothes either, Tara. Although I would have liked it if Guerlain had (re) issued a fragrance for our clothes in the meteorites violet fragrance, Scenting like Guerlain make up. But Maybe more for the fragrance itself not to complement other fragrances. Esperessence, it’s a shame they didn’t go down Meteorites violet fragrance road instead of French Kiss. It sounds rather more appealing. Thanks, Melissa. I have my own blog now at http://www.abottledrose.com if you’re interested.